Posted by todd under: Breezer Uptown 8; My bikes . I have previously written about why I bought the Breezer Uptown 8, and what I like most about it. Now it’s time to describe how it performs. While standing over the top tube, ready to push off and pedal, the first thing I notice is the position of the handlebars. They bend toward me at a natural angle, easing my wrists into a comfortable position as I put my hands on the handgrips. The bell sits within reach of my left thumb, and I get to the twist-shifter for the 8-speed internal hub by moving my right hand a couple of inches. I start pedaling. As I roll the shifter toward me (like a motorcycle throttle) to upshift, it clicks. That’s the only noise from shifting — the 8-speed hub does the rest of the work without a sound. The only noise the bike makes is the light whir of tires on pavement. There’s nothing to notice about the seat, and that’s good — it gives where it needs to and supports where it needs to. I can lean forward a bit and reach down, with a quick downward glance, to turn on the switch on my headlight while pedaling. The V-brakes over the months have gotten a bit mushy, and they could use an adjustment, but they do what I need them to do. I can shift into a lower gear while stopped — a particularly nice feature of the internal hub. Because of the upsloping top tube and the sweep of the handlebars, I maintain a comfortable upright position. There is very little weight on my hands. It’s not aerodynamic, but I’m not racing and I’m not worried about speed; in the wind, or while going uphill, I downshift until it’s easy to pedal. My elbows are slightly bent. It’s easy to keep my head on a swivel to survey the traffic around me. The position is so good, in fact, that it’s almost possible to forget I’m on a bike. I’ll find myself thinking about something else, then coming back with pleasure to the realization that I am still riding. The tires and suspension seatpost eat up the bumps, allowing for a smooth ride. The bike is not exactly agile around corners, but it’s not clumsy, either. It’s not “racy.” It’s steady, predictable, but still … fun. I don’t know a good way to describe this, but the Breezer is just plain fun to ride. Simple-intuitive, and it really brings back the thrill when I was 9 years old on my banana-seat Schwinn. In short, this is a great city ride — perfect for keeping your head up in traffic, nice for an unhurried pace (although it’s gone as fast as I’ve needed it to), and ideal for taking the turbulence out of a bad piece of pavement. 29 April 2008 at 1:44 pm. I am 5’8″ male with short legs (5’8″ inseam). I really like the looks of the diamond frame, but the standing height on the breezer website leads me to believe that I should be looking at the U frame. Is the U frame intended only for women? Thanks. 7 June 2008 at 7:13 am. I recently discovered the Diamondback Transporter 08 model. Does anyone here have experience with this bike? Is it worthy for adding to the Commuter biked 08 page? 31 December 2008 at 11:14 am. Todd, I have a ’93 Bridgestone MB-3 that has been converted into a bike very similar to the Uptown. While it’s very “BOBbish,” it’s just basically a MTB frame used in traffic situations. MTB frames are inherently a bit squirrelly for negotiating trails, trees, and rocks, and I’d like to have something a bit more laid-back for commuting. The generator lights and the 8-speed hub is very cool, too. Can you comment on the Uptown ride vs. a MTB ride? The closest dealer is half a day’s drive away, and I don’t plan to be in Atlanta anytime soon. Thanks. 3 January 2009 at 11:24 am. I must say up-front that the only MTB riding I’ve done was on an early-90s Bianchi Grizzly I converted for commuting purposes. I didn’t find its handling squirrelly. With that being said, I would say that I’ve found nothing squirrelly about the Uptown 8, either. If anything some might find it a little *too* laid back. I’d attribute that to the upright riding position. Sitting up, with little weight on the hands, makes for predictable handling on this bike. I would describe the design and the ride as “conservative,” in a good way. Hope that helps, any other questions just ask. 10 April 2009 at 10:50 pm. The bike industry needs to stop thinking in terms of “men’s” vs. “women’s” frame, which is arbitrary, and instead focus on the point, on the design itself, as Breezer does: “diamond frame” vs. “step-through frame”. The step-through Breezer frame ought to be available in Extra Large. It is totally irrelevant to think of the step-through frame in terms of rider gender. Instead, think of the frame in terms of ride quality. The industry for transportation bikes needs Extra Large step-through frames. 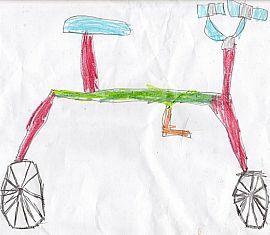 I didn’t even bother to test-ride the step-through Breezer at my local bike shop, as badly as I wanted the step-through frame, because it was only a “Medium” — about as well-suited for me as a mini-bike. It only comes in so-called “Large”, while the diamond frame Uptown comes in so-called “Extra Large”. The store’s largest Uptown frame was the diamond-frame in “Large”, so I test-rode that — though I ended up ordering the Extra Large, which I’m about to pick up. I’ve dialed-in my Specialized Expedition all-terrain mountain-hybrid bike, Dutchified it, but its fatal flaw is lack of a hub gear, as well as lack of built-in lights, and lack of a chainguard or chaincase. The Specialized served well as a research platform, and I’ve done much online research, analysis, and test-riding of hub gear bikes, as well as the Batavus, with *insanely* high-geared NuVinci hub (no low gear whatsoever). I love the curved-down top-tube of the Specialized Expedition — in fact, it’s the reason I chose that model. I only thought it was good-looking, like an inverted Cruiser shape, but it turns out to be great for easily mounting the bike, especially with large saddlebags. I would love to have a traditional Oma in my bike stable, but in a very large frame, light weight, with non-Rollerbrakes, and with a Premium 8-speed Nexus. I loved the Batavus’ step-through frame. Suppose you have a high top-tube bike with a child mounted behind the seat, and large saddlebags with baguettes protruding. You *can’t* swing your leg over the back, so a diamond frame is impossible to mount. I tore new $200 designer jeans raising my leg to mount a non-step-through frame. Even if a step-through frame is a little lower-performance than a diamond frame, when treating a bike as a load-transportation platform, a step-through frame is a gain in overall usability. Considered as a load-transportation platform, a bike without step-through ability is as impractical as a car without a door for entry. Dutch men are right: for daily ease-of-use, the Oma rocks (“grandma”, traditional step-through frame, on a bike designed to transport loads such as girlfriend with skirt on back rack). Joe Breeze is right, in designing a European city bike but one that has lighter weight and more responsive brakes (than Rollerbrakes) and lower gearing, thus providing American performance particularly for hills. You’d have to go to Europe and do much research too, to find any other bike with this balanced combination of attributes. Perhaps disc brakes would be an improvement, enabling better riding in snow. I might urge Breeze to offer the step-through frame in “Extra Large”. People in flat cities can’t understand, but the brakes and light weight and general responsiveness of the Breezer is essential — even though more expensive than a modest 3-speed Copenhagen Roadster with a coaster brake — for the serious, unrelenting hills of San Francisco and Seattle. I just hope that the Premium Nexus hub gear can handle my torque. I’m about to buy a large bag of pet food and some groceries in my large Dutch saddlebags and on my rack, on my Specialized all-terrain bike, to haul up my steep 320-foot hill. I’m concerned because I’m riding at night (so can’t see the shifter) and wearing headphones (so I can’t hear the shifter). If the twist shifter is in-between gears and I apply torque to the pedals, will the Nexus Premium break? If so, I would have to agree with people who reject the twist-shifter. My understanding is that torque must be limited, and that the worst usage is sloppy shifting while applying torque (most likely to break any hub gear). I had been riding my Dutchified low-top-bar Specialized Expedition all-terrain bike up and down the hills of Seattle, and particularly the Batavus step-through Ouverture, which rides like a sluggish pig, totally unsuited for hills, when I test-rode the Uptown 8 (Large, diamond frame). The Uptown was amazing in my 40-minute test ride up and down typical serious Seattle hills. Every rotation of the Batavus pedals, I felt like bashing my head against a wall, exclaiming “What the hell were they thinking when they geared this astronomically high, with no low gear!” The hernia-inducing extreme weight of that NuVinci-equipped Batavus makes for slow riding on the flats, and extra-laborious riding up hills, and the Rollerbrakes make for equally strenuous and ineffective braking when going downhill. That bike can’t even go fast downhill, it’s so overly heavy. I guess the insecure, wobbly feeling on the Batavus was from the extreme weight of the NuVinci and full-featured hubs, the too-narrow 1.5″ tires, the step-through frame, and my seat being 1″ above the maximum safety limit. The Uptown felt both more sturdy and more responsive, and was butter-smooth to shift. The NuVinci was difficult to shift, requiring effort and focus and coordination. My girlfriend loved the *looks* of the Batavus, but I said no way, it’s a huge pig of an unresponsive, dangerously sluggish bike, particularly for hilly Seattle. For safety, I’d far rather recommend everyone ride an Uptown, rather than a heavy, Rollerbrake-equipped European city bike, in a hilly city. The Batavus felt very wobbly, with the 30-pound back wheel perched upon a merely a 1.5″ width tire. The very latest Uptown has a 1.75″ Schwalbe City Plus tires, *not* 1.5″. I have had 1.5″ Schwalbe Marathon tires on my 26″ wheels on my Specialize Expedition all-terrain mountain-hybrid bike, and I consider that a mistake: I should have put 1.75″ or 2″ semi-slicks on this mountain bike, which had 1.95″ semi-knobby stock tires. The Azor Dutch city bikes have 1.75″, large tires. Even with the wide, sure-footed 1.75″ tires, the latest Uptown rode like a breeze: combining sturdiness of a wide semi-slick tire, with the responsiveness of a 26″ wheel (for the *constant* speed changes in city riding). 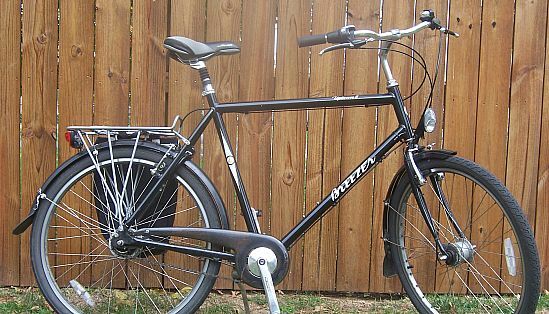 As Dutch Bike Seattle says, the Azor is a “Cadillac”: once you get up to speed, it rolls smoothly, but there’s the problem: for U.S. city riding, you never “get up to speed”; rather, you’re *constantly* braking and re-accellerating. I think the 26″ rims are one reason the Breezer Uptown is so responsive. Yet it also has raked (curved) forks, giving it the steering stability that’s needed for one-handed riding in city conditions. Maybe Dutch Bike Seattle doesn’t actually sell Azor bikes (heavy, Rollerbrakes) to Seattle dwellers, but rather, mail order to other, flatter cities. A $1600-1800 Azor, for hill use, though heavy and slow to brake? The Azor is the opposite of what’s needed for Seattle hills. Yes, I could survive fine with a heavy European Rollerbrake bike in Seattle, but there are better-suited options (lighter bikes, with more responsive brakes). Yes, the Azor is a heavy-duty load-transportation platform, but not the best balance of attributes for general use in hilly cities by typical people. When the Dutch ride hills, they often choose a Batavus or Gazelle that is of a “sportive” design — with rim brakes and a derailleur, and non-suspended forks. I like the Uptown’s balance of attributes better — I just hope the Premium Nexus holds up, especially if I gear it down. Hub gears are not all the same. From what I’ve read, and from test rides, the Nexus 7-speed isn’t as smooth, strong, widely geared, or easy to shift as the Premium Nexus 8-speed — the latter is a big step in the direction of the Rohloff Speedhub. The Alfine is a little better than the Premium Nexus, in ways I need to be able to summarize. At one point, I wanted a Bianchi Cafe Racer, but it only has a regular Nexus 8-speed hub, not the Premium Nexus. And the Bianchi lacks an adjustable-height stem, and lacks a full chaincase, and is too small for me, and has too-flat handlebars, and lacks the *added* (not “weak” or “slight”) security of an O-lock. Joe Breeze wisely respects the attributes of a Dutch city bike, while finding a way to inject American hill performance as well. 5 May 2009 at 10:44 pm. My first real commute bike was an Indian Speedking SLR, step through frame, single speed. I guess here you would call it an English Roadster. For ten years, I rode it every day – rain or shine – through the potholed Bombay roads until I came to America. It was still running well enough at that point to be handed down to a cousin. I love the upright riding position that it had and as you know, have had very little success finding such a bike here. I rode a couple of “vintage” Raleighs and Schwinns but I found it hard to shift gears properly and they were all diamond frames. Then I got pregnant and gave up on uprights altogether in favour of recumbents. I think I’m ready to try an upright again if it will give me the correct riding posture. I tried out a Novara at REI this weekend after reading this blog but I found that the posture was still too aggressive for me. I had to lean forward to reach the handlebars. The REI sales clerk said that it was not possible to raise the handlebar stem, and I had to pick a cruiser style bike instead. I don’t think that’s exactly what I want either. Do you know if the Breezer riding position is somewhat similar to this? I have a Breezer dealer somewhat close to me, but much further than the REI. I want to get a sense of whether its worth it before going all the way out there for a test ride. I have two young children and a full time job, so I don’t have much time to spend focusing on bikes any more. 14 May 2009 at 10:49 am. The short answer is, you can get a very upright position on the Uptown 8. It has a quill stem, which is easy to adjust if you decide you want the bars higher. The step-through frame might be a great bet for you. If sticker shock is a factor, I would seriously consider the Villager (7speed, $650), Citizen ($550, 3-speed) or Freedom ($430, 3-speed). (prices approximate) All of them will offer a similar riding position. I would definitely call ahead BEFORE making the trip to make sure the shop has the bike you want to try in stock. 6 December 2011 at 2:07 pm. Great post, Todd. I bought my breezer freedom about 5 months ago and I’m very very happy with the ride. I bought a medium frame step-through. I’m 5’10” with a fairly short inseam and I have it dialed in pretty good. The great thing about the breezer bikes is that the frames are the same i believe between the different models. They just upgrade componentry. For example, the frame stays are pre-drilled for a frame lock even though one isn’t mounted on the freedom. I added a nice axa defender frame lock to my ride. I really love it. As you’ve stated above, this is a comfortable ride. It’s such a fun ride. I’ve upgraded my tires to michelin city 1.4″ tires. I’m able to inflate to 80+ pounds and it makes for a very easy ride on the flats. I just roll and roll and roll. I mounted a little grocery basket from Safeway on my rear rack and I can do all my grocery shopping on my bike now. I’m rarely in the car anymore. Joe Breeze has a winner with this comfort/city line of bikes. The 3-speed nexus is geared a bit low, but when I hit the occasional hill in San Jose, I’m glad I have it. I could always upgrade to a better nexus hub, but I’m very happy with the low end hub at this time. I’m glad I ran into your blog. Not many folks have written much about the breezer freedom. I’m another happy owner as of June 2011. As regards a plug for Breezer, they do have a facebook page for any takers. I posted a video on their page about my ride.